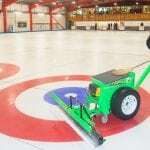 Work has been completed on installing a new £850,000 ice pad at Edinburgh Curling Club at Murrayfield, with more than £500,000 raised by club members as part of a £1.1 million project which will include replacing the building’s external cladding. An estimated 1600 members from 80 clubs based at the rink will benefit from the energy efficient and environmentally friendly surface, which will drastically cut the amount of water required to freeze the surface and reduce energy consumption by up to 20% per year. 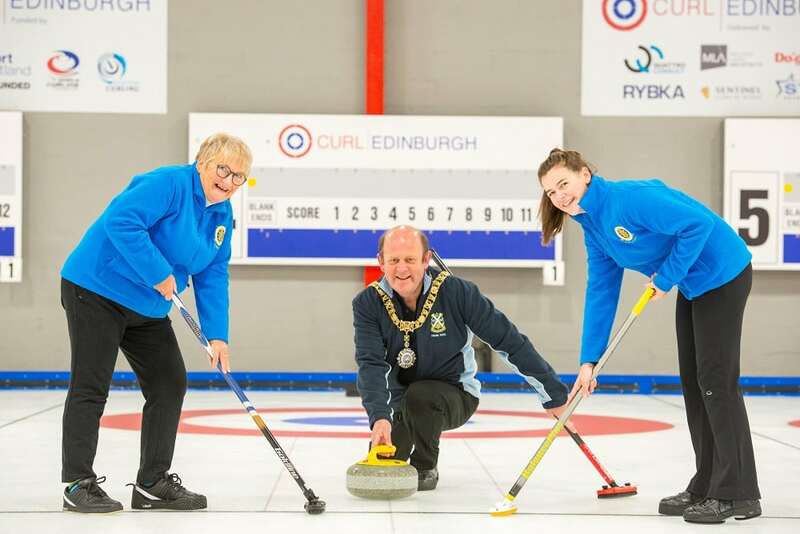 Edinburgh Lord Provost, local councillor and keen curler Frank Ross, threw the first stone on the new ice pad at a special Donors’ Bonspiel held to mark the occasion. The rink floor has been named in memory of Douglas Baxter, the late ice rink manager, who sadly passed away last year aged 39. Sweeping for the Lord Provost was Edinburgh Curling Club secretary and president of the ladies branch of the Royal Caledonian Curling Club Margaret Nicol, and Holly Davis, Scottish Curling Academy player and secretary of Gogar Park Young Curlers, while Edinburgh Curling Club president Colin Baxter skipped. 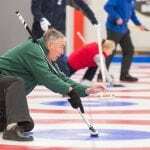 Norman Watt, chairman of Murrayfield Curling Ltd, said: “The generosity of our club members and the welcome support from sportscotland and the World Curling Federation has provided Edinburgh curlers with one of the best ice surfaces in the UK. “By reducing our water consumption by a factor of five we will enjoy substantial energy efficiencies, and when the modernisation programme is complete in 2019 we hope to have reduced power consumption by 30%. 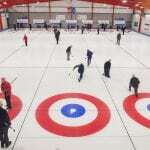 Edinburgh Curling host Try Curling sessions which provide a great taster to the sport. The sessions include an introduction to the basics and information on how the game is played. The cost is £10, payable on the day and participants should be 8 years of age or older, families and groups are welcome. 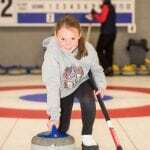 For more information on Try Curling session and Edinburgh Curling, please visit www.edinburghcurling.co.uk. Issued on behalf of Edinburgh Curling by Sure Public Relations Ltd. For further, information please contact Stephen Rafferty on +44 (0)7980 598764 or email stephe@surepr.co.uk. No Replies to "Capital Curlers Celebrate New Energy Efficient Ice"